Vegetarian stew and chowders are similar to soups, but are much more full bodied and dense. They stick to the ribs and will please even the most insatiable appetites. These raw stews and chowders can contain a myriad of ingredients and encompass the flavors of world cuisine. A good food processor is required to make these recipes, though if you’re skilled with your blender you may be able to make these recipes in your blender. Using the “S” blade in your food processor and pulsing a mixture of high water content ingredients with those that are not so high in water content will make preparing much easier in my experience. I usually add any dry herbs or spices near the end once the mixture is processing smoothly. It’s not uncommon for me to process two batches to make one meal. My dream is to find a much larger food processor some day, but until then I’ll work with the 11 cup model I have. Unlike my soups which I prefer to be cleaner and lighter, I personally enjoy my raw vegetarian stew and chowders spicier. Fresh ginger, cumin, and hot red peppers are three of my favorite spices. Fresh herbs really contribute to the flavor of these recipes as well. Fresh cilantro, rosemary, mint, basil, thyme, oregano, or flat leaf parsley can take your stew or chowder to the next level and boost the nutritional value. Sometimes I add seaweed for flavor and a nutritional boost, but seaweeds are also good for sucking up moisture is your stew is a little too watery. Raw stews are ideal for someone on a low fat diet because they’re very hearty and filling with little to no added fats. Let’s not forget that the whole idea behind the raw food diet is eating healthier food. These raw stews and chowders are loaded with nutrition. 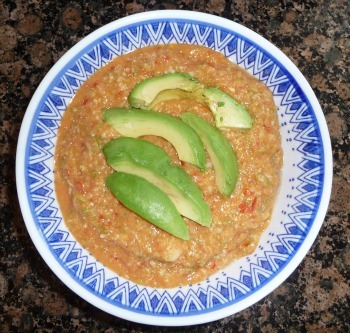 Just like raw soups these recipes are easy to make and cleanup after. Many times you can make a delicious Vegetarian stew or chowder from ingredients you have on hand in the kitchen and in the fridge: a cucumber, ½ a head of cabbage, ½ a bunch of parsley, 2 tomatoes, a chunk of ginger root and Bam, you have a raw stew. Easy simple and quick. Check out all the recipes below and try the ones that appeal to you. And please come back to check out new recipes as they’re added and to post your own favorite raw stew and chowder recipes so everyone can enjoy them. Do you have a great vegetarian stew recipe? One that make your mouth water just to think about? Share it here so we can all reap the health benefits and savor the goodness that you created!